In so doing, the tendons, muscles and soft tissue have to stretch under the weight of the body (as the ideal measure) because of the ever-necessary adjustment to the unevennes of the surface. 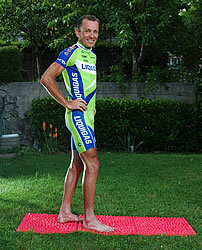 Also, in order to “overcome” the obstacle, they have to lift the feet and the body thus getting – stronger. 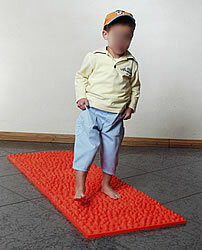 When walking on a surface like the Sand-y Natural Walker®, one has to overcome smaller/bigger bumps on one side and immediately after, by descending into the polyurethane foam with entire body weight, stretch and raise the whole body by contracting the muscles of one's of feet and legs. The muscles of feet and legs have to balance all the time during such a walk, thus maintaining the necessary body balance. 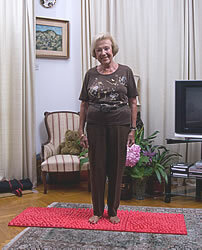 The mobility of joints in feet and ankles increases and the muscles of feet and legs are strongly activated. This strongly activates the “muscle pump” which rushes the blood from the capilaries and venules in the feet towards the broader veins in the legs, in the direction of the heart. Preventive and therapeutic clinical application of this medicinal surface would be beneficial to all children over one year of age (as soon as they can walk) until the end of their growth, regardless of possible foot pathology, and even more so for those who suffer from a foot deformity, with reccomendation of the appropriate specialist, of course. "We wish you well, particularly good health at any moment and at any place wherever you are"
Aleksandar Stošić, I was born 14th June, 1955 in Rijeka, where I graduated from primary school, high school, and from Medical school in 1980. As a third-year student, I co-authored a scientific research paper that won second prize in the University of Rijeka. In February 1983 I took a job with the Clinical Hospital Center in Rijeka. First in the Sušak admittance clinic, and since June 1985 in Kraljevica Orthopaedic Hospital. I passed my specialist exam in orthopaedics in Zagreb on 31st August, 1990. Since November that same year, I have worked in Kantrida Children’s orthopaedics ward of CHC Rijeka. From February 1992 to March 1994, and again from 1998 to September 2008, I acted as the Chief/Head of Children’s Orthopaedics Department. Since September 2008, I have worked as the Manager of a private company, SANDI-INVENT d.o.o. I got my Master’s Degree in the field of orthopaedics at the University of Zagreb Faculty of Medicine, where I defended my thesis entitled “The significance of determining the body’s center of gravity in patients with idiopathic scoliosis” in May 2003. From the academic year 2003/04 to academic year 2007/2008 I participated as a lecturer and instructor in a part of the class “Special topics” of the Senior Physiotherapist Study at the Faculty of Medicine in Rijeka, with the status of external associate. I was both a participant and lecturer at numerous professional and scientific congresses and symposiums in Croatia and abroad, and I had also co-authored multiple scientific papers published in various publications in Croatia and abroad. From my works, I would merely like to point out the following: participation by poster and first introduction of multi corrective Bebax® booties in treating congenital foot deformities of newborns and infants in Croatia; participating as co-author at the II. Congress on innovations in neurosurgery (Berlin 1997) and winning first prize for a poster presentation (as the first co-author) at the V. Alpe-Adria pediatrics symposium in June 1997 in Rijeka; poster at the international CEOC Congress in Prague 2004, etc. Previous education in orthopaedics: two weeks in several orthopedic hospitals in The Netherlands (1995); two times six weeks (in 1996 and 1999) at Istituti ortopedici Rizzoli in Bologna (Italy); two weeks in arthroscopy at the Lovran Orthopaedic Hospital. Previous education in manual medicine: Certificate from my first teacher, a master of chiropractic and osteopathy, Vjekoslav Bolkovac; various courses in Italy, 4 courses in the Kaltenborn-Evjenth method, 5 courses in osteopathy, AB courses from the Mulligan concept. I hold the golden card of the Croatian Homeland War Volunteers Association, The Homeland War Memorial Medal 1990-1992, A letter of gratitude by the Croatian Chamber of Physicians and several other recognitions for my professional and scientific work.